This famous surname is of Anglo-Saxon origin, and has two sources; firstly, it may be a topographical name for someone who lived by a path across a heath, from the Middle English "hath", a development of the Olde English pre 7th Century "haeth" meaning heath, plus the Middle English "way", from the Olde English "weg" way. Secondly, it may derive from the rare Olde English personal name "Heaethuwig", composed of the elements "heaethu" meaning strife, contention, plus "wig" war, which has Continental cognates such as the Germanic "Hedwig" from the Old High German "Haduwig". The surname dates back to the late 12th Century, (see below). 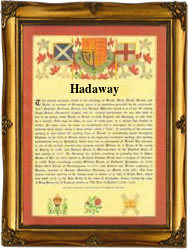 Variations in the spelling of the surname include Hathway, and Hathaway. London Church Records list the christenings of Thomas, son of John Haddyway, at St. Margaret's, Westminster, on the 22nd March 1616, and of Katherine Hadaway at Allhallows London Wall, on the 7th April 1681. A Coat of Arms granted to the family is black, with a buglehorn garnished silver. The Crest is a red demi lion rampant, holding in the dexter paw a fleur-de-lis. The first recorded spelling of the family name is shown to be that of William Hadewi, which was dated 1178, in the Pipe Rolls of Herefordshire, during the reign of King Henry 11, known as the Builder of Churches, 1154-1189. Surnames became necessary when governments introduced personal taxation. In England this was known as Poll Tax. Throughout the centuries, surnames in every country have continued to "develop" often leading to astonishing variants of the original spelling.